Friday November 13, 2015 is a day that no one is ever going to forget. Over a hundred people were killed in Paris yesterday in a horrific attack that took place all over what is usually called the City of Love. It is a tragedy. It is something that will change, not just Paris, but the entire world. So many people lost their lives and my heart goes out to the families and friends of the victims. My heart also goes out to the people of Beirut, Lebanon who also suffered a horrific attack recently. The bombings happened on Thursday and everyone is still reeling from the nightmare they faced. I can’t imagine what it must have been like. Unfortunately it doesn’t end there. Japan was hit with a major earthquake and tsunami and I think most people probably know that Mexico was recently hit with an earthquake and a hurricane. Both these places have suffered horribly and once again I can’t imagine what they’re going through. And finally, though it is just as awful as all the others, Baghdad, like Beirut, was hit with several suicide bombings. The people are shaken, but from what I hear are standing strong. The media doesn’t cover all of these with as great detail as the others so a lot of what I learn about these tragic events I learn online. From what I understand the people are standing strong in all of these places. They’re scared and don’t know what might be coming next, but they’re standing together to show that this won’t tear them apart. 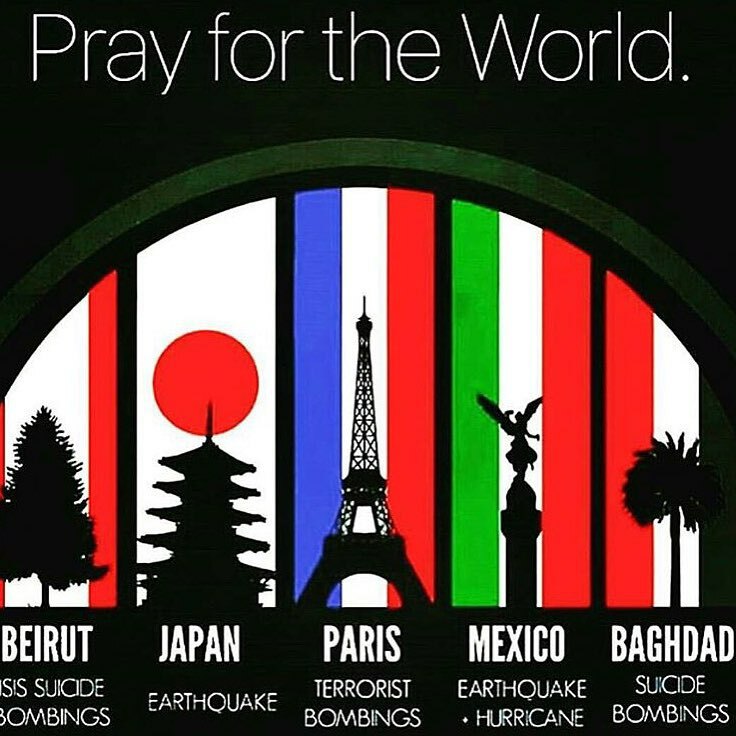 There is nothing anyone in the world can do that can really help take away that pain, but I hope the people of Paris, Baghdad, Beirut, Japan, and Mexico know that the rest of the world is with them. We are all thinking of you and praying for you and we will do whatever we can to help you get through this.